Yep. You read that right. Since Governor John Kasich’s budget took effect, local governments have added 5,600 jobs. Incidentally, they lost 31,300 during his predecessor’s tenure. “Despite this growing revenue and all these new policy changes in the mid-biennium review, nothing is being done to curb the growing financial crisis for schools and local communities that was brought on by last year’s historically deep state budget cuts,” said House Minority Leader Armond Budish, D-Beachwood. The Government Finance Officers Association advises governments to keep a two-month reserve in the bank for emergencies. With the addition of the surplus from the closing fiscal year, Ohio’s reserve now is at $482 million — less than a week’s worth of spending. 5,600 jobs created by local governments since Kasich’s budget took over. That’s not funny math. 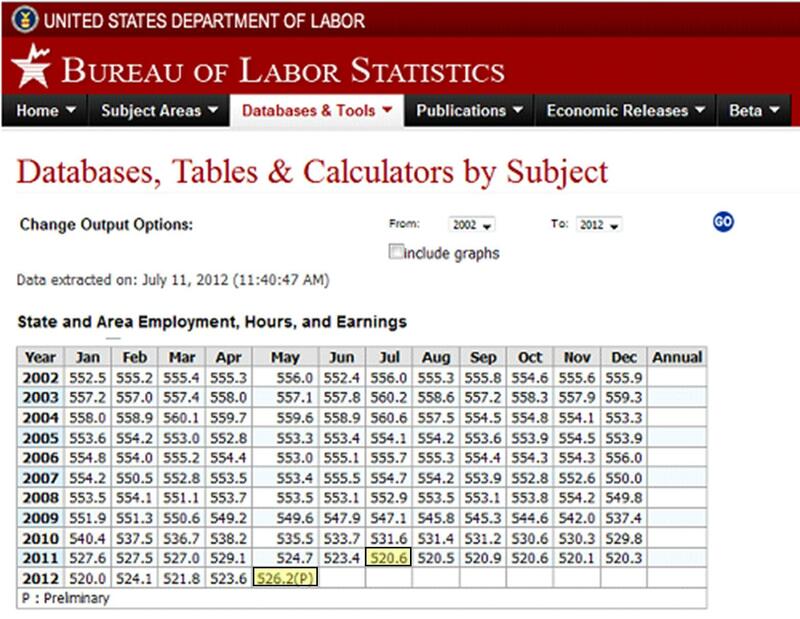 That’s data directly from the Bureau of Labor Statistics. We’ve highlighted when Kasich’s budget took effect and where it stands today. From 520,600 local government jobs to 526, 200 jobs under Kasich’s budget… in less than a year. In other words, on average, local governments needed to increase taxes more often under former Governor Ted Strickland than they have under Governor Kasich. But to be more factually accurate, the difference is negligible, as tax issues hover around 1,000 to 1,050 per year regardless. But, even with all things being equal, local governments still lost 31,300 jobs under Strickland. Under Kasich, job numbers grew. So how do Democrats explain that one? Really, Jerid? Because a full year before Kasich took office, BLS numbers show that local governments cut over 12,000 jobs. If Strickland’s recovery started then, why the cut? Where was the growth? Kurtz also goes on to say he can cite 10 examples of municipalities and school districts looking at layoffs and tax hikes he says can be blamed on funding cuts. 10, huh? Considering there are over 3600 taxing entities in the state of Ohio, that represents a measly 0.28%. Perhaps when the extreme majority of local governments are able to manage—to the point of adding jobs—the less than 1% of local entities are simply bad with finances? For example, and as we’ve discussed previously, Lorain schools lived high on the hog, with bloated compensation packages, amidst an influx of one-time federal stimulus dollars, and are now struggling because of it, despite the fact that Governor Kasich increased state funding to the district. But these districts are the exception, not the rule. The vast majority of local governments and school districts were able to absorb any cuts they might have experienced by becoming more efficient—more responsible—with each and every taxpayer dollar. And they’re creating jobs. But it won’t stop Democrats from lying about it every chance they get. After four years of learning from the best, they’ve discovered that lies can be effective. And Mr. Kurtz is being paid to toe the lying, deceptive, and intellectually dishonest party line. So, to Jerid and all of his Democrat friends, don’t mind us for pointing out just how full of crap you really are. We’ll be doing it for the foreseeable future.